Born 14 July 1946 in Danville, Illinois. My father was a Navy Fighter Pilot (triple ACE in the Pacific, WW-II) and a career Naval Officer. Being a Navy brat, I went to schools in Jacksonville, Florida; Providence, Rhode Island; London, England; Arlington, Virginia; again in Jacksonville, Florida; and the University of Florida in Gainesville. In August 1963, as a junior in High School, and at my father's retirement ceremony, he swore me in to the Naval Air Reserve. He had been the Commanding Officer of the Naval Air Reserve Unit at the Naval Air Station in Jacksonville, Florida. That resulted in interesting weekend drills for the first couple years with the Naval Reserves, since it seemed every sailor whom he had ever punished was directly in charge of my "Training." Training was mostly standing guard on fire hydrants or low crawling in drainage ditches. WEBMASTER NOTE: I've heard back from some who cannot view the below photos. They are in Adobe PDF (Portable Document Format), and perhaps some browsers cannot display PDFs. You might try downloaing a free Adobe Acrobat Reader from Adobe.com. The whole point of joining the Reserves was to get through two years of college and then apply for Navy Flight School in their NAVCAD program. In 1967 I had advanced to an E-3 and was a Plane Captain on S2Fs (that's basically a crew chief). So I showed up at the Navy Recruiters office and announced that I had completed my two years of college and was ready for flight school, only to find out that the Navy had changed their program and I had to have four years and a degree before being eligible for flight school. Not to be diverted from my goal, I went next door to the Army recruiter and announced that I wanted to be an Officer and I wanted to fly. I sat down and took a series of tests and was told I could do that once I completed Basic training and it was suggested that I pick an MOS school in case there was a delay in getting into OCS. I picked Aviation maintenance and got a Conditional Release from the Navy to enlist in the Army. It was off to Ft. Benning and Sand Hill and, since I had already been through Navy Boot Camp, there were not many surprises until I got finished and waltzed into the Orderly Room, where I announced that I was ready to go to OCS. Surprise, surprise, the Army had changed their OCS requirements and I had to be in the Army for a year before I was eligible. Off I go to Ft. Rucker and after three maintenance schools I was a Mohawk Crew Chief and on orders for (wait for it) Vietnam. That was mid-1968 and I spent six months in the 225th Aviation Company as a Mohawk Crew Chief. For the entire last month I learned what hazing to expect at OCS. I was sent to Fort Belvoir, Virginia to Engineer OCS where I had my first encounter with Hal Alvord as one of my TAC Officers. He was so popular that one weekend we filled his office with so many old newspapers that you could barely open the door. I graduated in February 1969 and applied for flight school, but there was a waiting list. I went to an Atomic Demolitions and Munitions School (ADM) and then was assigned to the Engineer Agency of the Combat Developments Command (CDC) there at Ft Belvoir. CDC was one of those agencies that was run by an Army Officer, but was really run by a civilian Deputy and had mostly DA Civilians working there. It was the wrong place to put an energetic Second Lieutenant and, after completing four assignments in less than a third of the time normally allocated to do them, my supervisor arraigned for an immediate class date at Fort Wolters and helicopter flight training Class 70-10. Following graduation, it was back to Vietnam and to the 174th Assault Helicopter Company in June 1970. 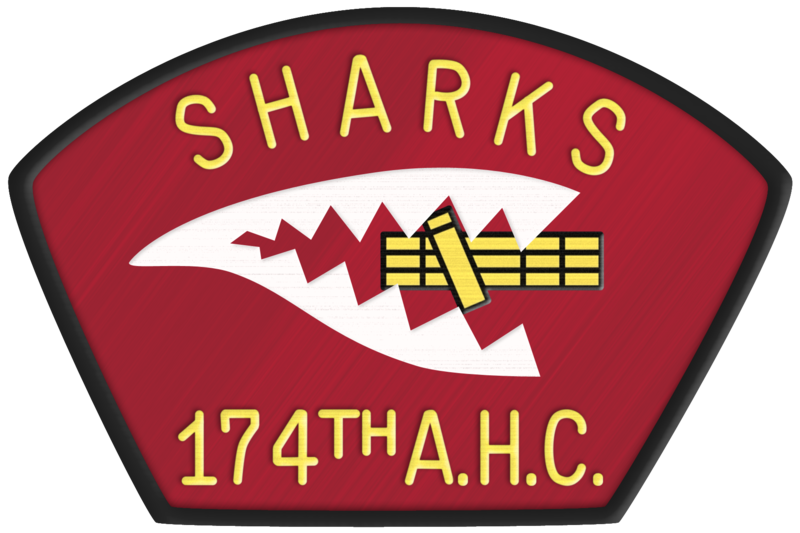 I was assigned to the 1st Flight Platoon where I made aircraft commander (AC) fairly quickly, then got to fly with the Sharks for about two months until Hal Alvord, the Operations Officer, called me to the Orderly Room and told me I was going to be the assistant Maintenance Officer -- and that the Maintenance Officer would be flying with the Sharks. Greg Smith was the Maintenance Officer because he had been to the school to do that job (AMOC) but he had no hands-on aviation maintenance experience. So I spent the remainder of my tour as the "Assistant Maintenance Officer." Greg did help when he had a down day but he was very good on the "Guns," and that's what he liked. Besides two engine failures, a transmission seizure, three tail rotor failures, my most exciting adventure was during Lam Son 719 along the DMZ. Most of the readers of this website know that Lam Son 719 was an operation to cut off the supply route that the North Vietnamese used that ran from North Vietnam through Laos, Cambodia, and into South Vietnam. It was their "Life Blood" and our mission was supposed to be to move two US Army Divisions and two South Vietnamese Divisions and their equipment into Laos before the rainy season started. The rainy season caused the route to be almost impassable or at least much slower to move supplies and equipment and it was thought the following year, the North would be very short on all the necessary supplies that they needed if we could accomplish blocking it for two months. Anyway, our "all knowing" Congress refused to allow any US troops to cross the border into Laos, so the operation that was planned to be two U.S. Divisions and two South Vietnamese Divisions, working together, was changed at the Laotioan border. At the border, only the South Vietnamese Division crosssed into Laos. The two South Vietnamese Divisions, without their advisors, were air lifted into Laos. In the early months of 1971, hundreds and hundreds of US helicopters filled the skies in I Corps (the Northern part of South Vietnam) headed to Khe Sanh, Quang Tri, and other airfields in preparation for the Air Lift that would be the "Largest Air Lift in American History." So, what you might ask, does the Maintenance Officer do while everyone else is flying in and out of extremely hot, enemy infested landing zones, dropping off and picking up, scared to death South Vietnamese soldiers. For starters, we inspect and fix all of the aircraft along with going out to where some of them got shot down, and trying to recover them either by fixing them on the ground or rigging them to be lifted back to be fixed. This goes on all day and all night, because all those aircraft are needed the next morning for another day of getting holes shot into them. Those were the mundane every day type duties. One night I was called to Operations for a meeting with two other company maintenance officers and the Task Force maintenance officer. He informed us that we were to be part of the next day's 60 helicopter lift into Tchepone, about 40 mile across the Laotian Border. He said we would have three recovery helicoppters flying in the vicinity of Tchepone so that if there were maintenance or battle damage that could be repaired, we would be there for support. We were also to recover air crews whenever possible. The plan was for two recovery helicopters at 3,000 feet and one flying at tree-top level. There were two Captains and one First Lientenant at the briefing, and you can guess who got to fly the LOW bird. It was really logical because I had been in Country seven months by then and the other two had only been there a short time, and had not flow any combat missions. The next morning I picked an engine mechanic, a rotor system mechanic and an airframe mechanic to go with me and, after several delays, we took off 15 minutes ahead of the rest of the mission. Twelve miles across the Laotian border, and as the rest of the mission took off, I rounded the top of a hill at about 15 feet above the trees. A loud explosion came from my engine compartment and there was a total loss of engine power. A 51-caliber bullet had hit my engine while I was flying at tree top level in the middle of the jungle. I made a quick MAYDAY call, then concentrated on what to do next. An audio recording made of my actual radio call that day was, "MAYDAY! MAYDAY! MAYDAY! Witchdoctor 5 is down, just to the west of A Louie, crashed into trees, over." I had seen many helicopters that had crashed in the trees and most resulted at least one and usually multiple fatalities because as the rotor blades hit the first trees there was so much torque that they ripped the transmission from it mounts and anyone near it would normally not survive. I was not going to let that happen to us. I pulled back the cyclic as far as it would go and that caused the nose of the helicopter to point straight up in the air. My thought was, instead the rotor system striking tree trunks it would start hitting branches which would slow it down and we would settle straight down on the tail boom crushing it but by the time the rotors hit tree trunks it would be slowed enough that the transmission mounts would hold. It worked and no one got hurt in that crash! However, we immediately saw bad guys heading toward us and one of our two M60 machine guns was stuck between a tree and the helicopter. My Crew Chief, Dave Smalley, set up his M60 and began firing at the approaching enemy as we destroyed the radios and then abandoned the crash site. As we moved south, we came across an abandoned machine gun position. It was a circular hold in the ground with the center pedestal remaining so the machine gun could pivot around 360 degrees with a tunnel in one side so the occupant could take cover when necessary. We checked it for booby traps and found none so moved in. We spent three days and two nights there and were under attack most of the time. Luckily I was able to make contact with the Air Force Forward Air Controller (FAC) in the area right away and they flew over us allowing me to call in a total of 97 air strikes. Dale Sprat called on the emergency radio to tell me I had been promoted to Captain on the second day. The Army inserted 100 South Vietnamese Rangers on the ground about two miles south of our location on the afternoon of the second day, but it took them all afternoon, night and most of the next day to reach us because of the intense enemy concentration. We later found out we had crashed in the middle of a North Vietnamese Divisional Headquarters. 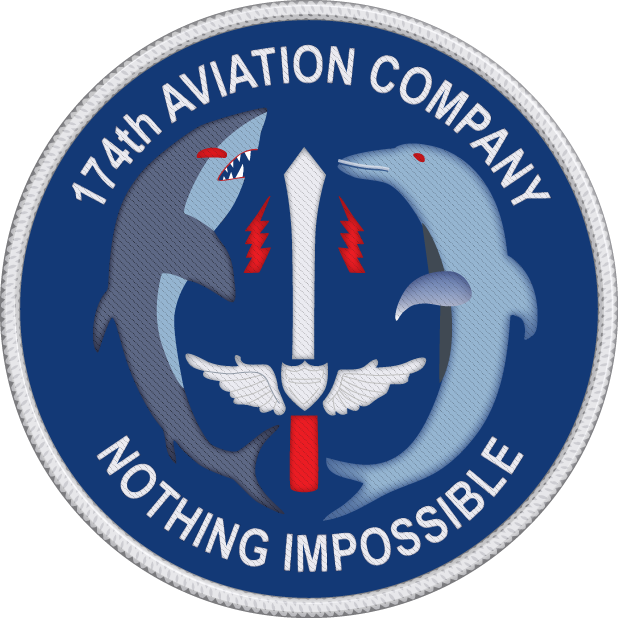 The whole story is on our 174th website. Click HERE to view the story and hear the radio transmissions. I left Vietnam in July 1971. In 1978 I was assigned to the Army Procurement Agency in Soul, Korea and because I had attended the ADM School I was assigned as The Adjutant of that agency. There had been a misunderstanding of my schools and they thought I had been to an "ADMIN school" instead of an "Atomic Demolitions and Munitions school." After about three months, I figured out what happened and got moved to the Chief of the Contract Inspection branch. I spent 20 years in the Army, but only one tour as an Aviator. As an Engineer Officer, I was sent back to the University of Florida to complete my degree, and that obligated me to Engineer assignments after that at Ft. Leonard Wood Missouri; Ft. Meade, Maryland; Jacksonville, Florida; Germany, and Ft. Lee, Virginia. After retirement, I spent time as a Deputy County Building Official; a Project Manager for a facility maintenance contract responsible for the three Naval Bases in Jacksonville Florida; and was the Airport Engineer for all four Airports in Jacksonville, Florida for 10 years. I am trying to be retired but find that difficult, and have started a new Water Restoration Business (Enviro Water Restoration, LLC) that uses a natural microbe to remove organic pollution as well as fats, oil and grease (FOG) and organic bottom sediment from water bodies and sewage treatment facilities in Jacksonville, Florida.